Bear & Company, 9781591432692, 336pp. Everyone has loving and wise ancestors they can learn to invoke for support and healing. Coming into relationship with your ancestors empowers you to transform negative family patterns into blessings and encourages good health, self-esteem, clarity of purpose, and better relationships with your living relatives. Offering a practical guide to understanding and navigating relationships with the spirits of those who have passed, Daniel Foor, Ph.D., details how to relate safely and effectively with your ancestors for personal, family, and cultural healing. He provides exercises and rituals, grounded in ancient wisdom traditions, to help you initiate contact with your ancestors, find supportive ancestral guides, cultivate forgiveness and gratitude, harmonize your bloodlines, and assist the dead who are not yet at peace. He explains how to safely engage in lineage repair work by connecting with your more ancient ancestors before relating with the recently deceased. He shows how, by working with spiritually vibrant ancestors, individuals and families can understand and transform intergenerational patterns of pain and abuse and reclaim the full blessings and gifts of their bloodlines. Ancestral repair work can also catalyze healing breakthroughs among living family members and help children and future generations to live free from ancestral burdens. The author provides detailed instructions for ways to honor the ancestors of a place, address dream visits from the dead, and work with ancestor shrines and altars. The author offers guidance on preparing for death, funeral rites, handling the body after death, and joining the ancestors. He also explains how ancestor work can help us to transform problems such as racism, sexism, homophobia, and religious persecution. By learning the fundamentals of ancestor reverence and ritual, you will discover how to draw on the wisdom of supportive ancestral guides, heal family troubles, maintain connections with beloved family after their death, and better understand the complex and interconnected relationship between the living and the dead. Daniel Foor, Ph.D., is a licensed psychotherapist and a doctor of psychology. He has led ancestral and family healing intensives throughout the United States since 2005. He is an initiate in the Ifa/Orisha tradition of Yoruba-speaking West Africa and has trained with teachers of Mahayana Buddhism, Islamic Sufism, and different indigenous paths, including the older ways of his European ancestors. He lives in Asheville, NC. "As with any relationship -- from your relationship to yourself to those with family members and society at large -- connections take time to grow. So it is with our ancestral relationships. 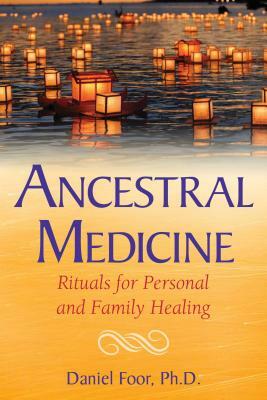 Ancestral Medicine can guide you in forming and keeping those relationships vibrant over the course of years, so that as we turn to our ancestors in times of need and joy, they will know they are lovingly remembered."